Welcome to the great world of light by Casa Padrino, your baroque wholesaler from the beautiful city of Essen (Germany). Whether you are looking for a dreamlike chandelier or a heavenly chandelier Whether you are looking for classic or modern, Casa Padrino is the place for you to find the right light for your interior design style and your needs! At Casa Padrino we offer you splendid chandeliers with extraordinary designs and modern chandeliers at permanently super low prices. Give your home that certain something at home. Modern chandeliers are the perfect choice to set sustainable accents. Of course, large rooms, such as an expansive hallway or foyer, are also well-suited to be embellished with a pompous chandelier or a beautiful light fixture decorated with genuine Swarovski crystals. 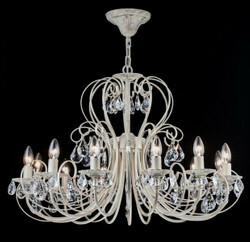 But playful furnished apartments or even restaurants and bars are perfect for a chandelier. He should be modern and extravagant in order to be the center of attention. With elaborate ornaments and crystals, these lights are real eye-catchers and eyecatchers in every reception area. Today chandeliers and chandeliers are celebrating a renaissance and we at Casa Padrino are very happy to be able to offer you a variety of different lamp styles with our collection. White, modern chandeliers, unusual black candlesticks in Venetian design or stately chandeliers in silver with glass crystals, at Casa Padrino your imagination knows no bounds. Many of our models are equipped with Swarovski crystals, which sparkle in the incident light and give the room a special shine. In our online shop you will find a wide selection of different styles and colors. Always with the right mix of glamor and style. To get an idea about our products in our online shop is one thing. But it is even more fascinating to experience our chandeliers, chandeliers and lamps directly and to convince oneself of the quality on site. If you happen to be in the vicinity of Essen by chance, we look forward to welcoming you to Casa Padrino. In addition to the wide range of immediately available lamps, we at Casa Padrino also offer you the opportunity to have custom-made to customer specifications. For further information about the complete offer just call us on + 49-201-36577485 and our qualified support will help you in every detail! Guaranteed! Casa Padrino, your baroque wholesale on the internet and on site.